A team of ex-Nokia employees has released the first handset running on a new smartphone platform. 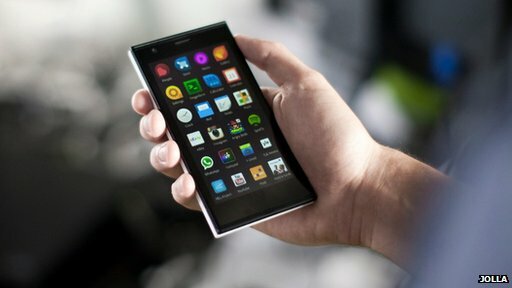 The Jolla phone - pronounced Yol-la - is powered by open-source operating system Sailfish, but can run most apps designed for Google's Android platform. The company has paired with a major Finnish network, and hopes to set up a similar deal with a UK operator. Industry analysts said Jolla faced a challenge in taking on a market dominated by Google and Apple. Just 450 Jolla phones will be available at launch on Wednesday evening, with the majority going to customers who have pre-ordered the device. Co-founder Marc Dillon told the BBC the company was in the process of ramping up manufacturing. He said the phone's ethos was to provide a more "open" approach to how people used their mobiles, a contrast to the relatively closed systems used on the iPhone and, to a lesser extent, Android devices. "There's different opportunities for people to get apps form different places, different stores," he said. "We've created a world-class platform. Users will be getting more choice." The platform - originally called MeeGo - was developed by Nokia, but dumped in 2011 in favour of the company adopting the Windows Phone system. Nokia released just one handset running the software, the N9-00. Antti Saarnio, chairman and co-founder of Jolla, told the BBC in May that MeeGo - now called Sailfish - had not been given enough chance to succeed. "Everybody felt so strongly that they wanted to continue," he said. Large parts of the Sailfish code were open-source, which meant anyone could expand and adapt the platform, Mr Dillon said. "We are ramping up our Jolla community right now. "There's already a Sailfish website so that developers can come and contribute." According to CCS Insight, 81% of smartphones shipped globally from July to September ran Google's Android software. Apple's iOS accounted for 13%. Smaller players such as Blackberry, Microsoft and Mozilla made up the numbers. Analyst Geoff Blaber, from CCS, said while it might seem Jolla was taking on an impossibly large challenge by trying to muscle in, its strategy could pay off. "It's easy to characterise this as David v Goliath," he told the BBC. "But the fact is if Jolla can maintain a competitive cost base, there is already an enthusiast base seeking this product. It could be successful." But Mr Blaber added the handset was a means to an end, and that Jolla's long-term strategy was to create a operating system it could licence to other manufacturers. "This is the challenge," he said. "At the moment we have a situation where Android is utterly dominant. They've got to prove the software is competitive and it works." Jolla may also be buoyed by support in its home country as a result of Microsoft's planned buy-out of Nokia. Jolla co-founder Mr Dillion said he was getting "stopped everywhere I go". "We're not trying to piggy-back, but we have seen a bump," said Mr Dillon. "We've had a lot of support in Finland." Mr Blaber added: "This is the 'what might have been' scenario had Nokia not gone down the Microsoft road with Windows Phone."